A kitchen drawer pull that picks up design elements in your decor is a beautiful way to tie your kitchen or bathroom theme together. 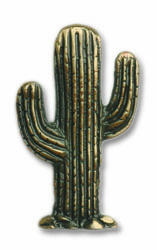 Pictured above is our southwest drawer pull in the Kokopelli design. We also offer the southwest drawer pull, cactus drawer pull and western drawer pull designs: the cowboy boot and horses which are shown below. Perfect for kitchen cabinets and drawers, bathroom cabinets and drawers or dressers, bureaus or console tables. 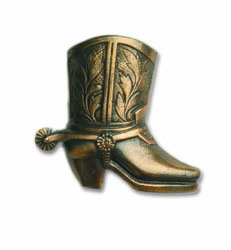 Note: Cowboy Boot cabinet drawer pull and Kokopelli cabinet knob are available in right-facing and left-facing versions. Please specify direction at time of order. 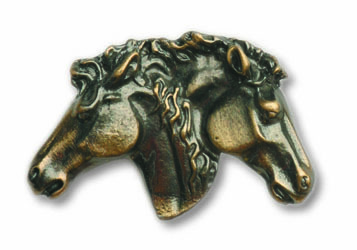 Western drawer pulls and cabinet hardware are available in antique brass, pewter or nickel. Other finishes shown are available by special order (add an additional 14 days to the availability time shown below). Please call or email us for special orders. Each western drawer pull or cabinet knob comes with a standard 8-32 UNC-1 inch long combination drive screw. All pulls are finished and coated with a clear baked-on lacquer finish. Take care that any sharp points due to design does not cause hazard to children or adults. Installation and placement of the hardware is the responsibility of the installer. There is a 20% restocking fee for cabinet hardware.